At least according to the influential and successful Canadian fund manager Eric Sprott. Mr. Sprott makes me look like permabull Larry Kudlow by comparison. * He’s predicting the gauge will fall 40 percent to below 676.53, the 12-year low reached on March 9. “We’re in a bear market that will last 15 or 20 years, and we’ve had nine of them,” Sprott said in December. Mr. Sprott is swimming in the deep end with heavy investments in commodities and miners, so he is talking his book to a certain degree. I don't buy the gold argument at these levels, but it's important to consider all opposing viewpoints. FINANCIAL CRISIS MANAGEMENT(1) IN GENERAL.In unusual and exigent circumstances, the Board of Governors of the Federal Reserve System, upon the written determination, pursuant to section 1109 of the Financial Stability Improvement Act of 2009, of the Financial Stability Oversight Council, that a liquidity event exists that could destabilize the financial system .... and with the written consent of the Secretary of the Treasury (after certification by the President that an emergency exists), may authorize any Federal reserve bank, ....Upon making any determination under this paragraph, with the consent of the Secretary of the Treasury, the Financial Stability Oversight Council shall promptly submit a notice of such determination to the Congress. The amounts made available under this subsection shall not exceed $4,000,000,000,000. According to Comscore, total online holiday sales totalled $27.1 billion. Once the figures are adjusted for the number of shopping days last year and this, the improvement was only 3.5% (up about $900 million for the ENTIRE world of ecommerce). The spin in the press release tries to frame this as a positive result, but since this just gets us back to 2007 levels of online sales, I don't think this can be viewed as a huge win. Now that we almost have the naughts behind us it's a good time to look out into 2010. I tend to believe that there is little value in preparing for and reiterating the consensus. The general line of thinking around most in the financial community is that 2010 will be much more of the same - rebounding corporate profits, limited hiring, but stocks can go higher because it seemed to work in 2009. Well that line of thinking works until something changes the game. So while all of these events have low probabilities of occurring in 2010 they are events that should be on our radar and could seriously derail our fragile "recovery". * Interest rates rise in the US - a move of 1-2% in the 10 yr note would stop the housing market in its tracks. * Dollar Rally? There are enough people betting on the demise of the US Dollar that the rush to exit that trade could create a massive short squeeze. The impact of this sort of rally would crush all commodities -- like gold -- and stocks. * Housing is showing signs of weakness again and I don't think there will be any political appetite to come to the rescue of the Realtors again in 2010 (an election year). * Lots of geopolitical risks exist in the market - Iran, Pakistan, etc, but the market has not assigned almost no value to those risks. Finally, I've tried to highlight before the importance of thinking outside of the box and avoiding herd mentality that tends to get you trampled. Consider this stat "The level of Bears in today’s Investors Intelligence reading fell to 15.6% from 16.7% last week and is now at the lowest level since April 1987." This isn't an indicator of any impending collapse, but when this many people are all bullish it's usually a sign that there is reason to be wary. I continue to argue that Pop Music is about as bad as it has ever been, but my wife and daughters have tried hard to swing me over to the dark side. I don't think I'll ever consider any of these songs "good" (particularly the dreadful Black Eye Peas song) but apparently if you take 25 bad songs and mash them up together you can make a pretty interesting song. Listen to the mash-up now before Time Warner, Sony, etc, make Youtube take down the video. While I'm on the subject of pop-culture: I finally got around to watching "Frozen River" last night. It's a story of smuggling and desolation in NNY -- shot in Massena, but it could be Watertown, Odgensburg, etc. As the cold settles in on us, it is a great dose of depression in middle of our freezing nights. The markets have been quiet this week as expected. I'd expect more of the same through the balance of the week as many traders will look to get out of town early if a snow storm bears down on NYC. The one variable is tax selling that can occur at the end of the year. However, given the relatively small number of losing stocks in many accounts I'd expect limited tax selling. 1) Truck Tonnage increased !! in November --- The American Trucking Associations’ advance seasonally adjusted (SA) For-Hire Truck Tonnage Index increased 2.7 percent in November, following a 0.2 percent contraction in October. It should be noted that the "not seasonally adjusted index" fell 8.0 percent from October. I have a tough time reconciling the differences in these numbers. Tonnage "increased" due to inventory restocking, but total tons shipped were down almost 10% when you back out seasonal factors. 2) Delinquencies skyrocket! This has building through out the year, but the rate of delinquencies is starting to scare me. Fannie Mae reported today that the rate of serious delinquencies - at least 90 days behind - for conventional loans in its single-family guarantee business increased to 4.98% in October, up from 4.72% in September - and up from 1.89% in October 2008. It's too early to make any bold calls on what this means, but I suspect that we may be undergoing a cultural shift caused by the Great Bailouts of 08-09. Borrowers may be feeling that there is less stigma associated with default and in fact, it could be a financially savvy move to stop paying their mortgage. This is the sort of moral hazard that we all feared when we started the bailout process. 3) I find the story of US Fidelis particularly interesting. If that name rings a bell, they were the company running lots of ads on late night cable TV selling extended warranties for cars. Well, they've now cut 80% of their workforce and stopped selling new policies. The company blames the economy and criticism from media (accurate criticism in my opinion). I wonder what impact "cash for clunkers" had on their business model? For every, auto scrap yard that added 4 jobs stripping old cars, there seem to be plenty of jobs lost at companies like US Fidelis. 4) Data games... Some smart cookies have actually decided to look at some state data relative to Federal data on unemployment. For example, in the month of November when the BLS said the US economy lost 18,000 jobs we all rejoiced. However, as some have pointed out NJ reported a loss of almost 11,000 jobs in November. So, if both sets of numbers are to be believed a NJ -- a fairly strong economy based in financials, pharmaceuticals and consultants -- accounted for 60% of all jobs lost in the US last month. Hmm, something doesn't pass the smell test. Revisions to be timed with a request for stimulus part deux? Most investors have realized substantial gains this year and will look to coast into the new year on our highs. There will be little in the way of market moving news this week and the sentiment right now seems to be if we go a little higher expect a flood of new buying. I'll reiterate that business activity that is not tied to stimulus spending is really anemic but the stock market is acting independent of fundamentals at this point. Some market observers are a little worried about the light volume and the concentration of trading in some names, but again it should be quiet this week. The story of the housing bubble is definitely in our rearview mirror for most of the country --- however, I'd argue that there has been a bubble building in low-end houses as a result of the tax credit --- but I thought you might appreciate the history of one house and one borrower in NJ. Mortgage $301,500 7/3/2003 --- refinanced and took out "equity". Mortgage $347,700 7/12/2004 --- refinanced and took out MORE equity"
Mortgage $43,443 10/3/2005 --- took out a bonus 2nd mortgage! Couple of get jet skis at the shore house. This was fairly typical in many bubble markets. So much of our retail economy was built on this type of excessive spending. I can't see this spending returning any time soon. Markets are moving higher on thin volume as the US dollar weakens again. "The greenback dropped for a second day against the 16- nation euro as an unexpected decline in new home sales and a report forecast to show a decline in business activity underscored the fragility of the U.S. recovery." So in the perverse world of equities down is up --- because the US economy looks shaky, the dollar is falling again, so comm odity prices - including stocks - are rising. It's time to turn off the computer for the holiday in order to regain some sanity. 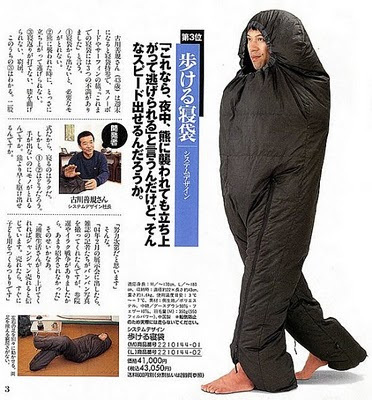 According to people better versed in translating Japanese infomercials the headline includes the text: "In this thing, you can quickly jump up and escape if you’re attacked by a bear in the middle of the night." Thanks again to all the many loyal readers that have pushed my up into the top 600,000 websites globally. As we entered November it was not clear if Congress would extend the First Time homebuyer tax credit so there was a massive rush to complete sales in November and claim the credit. "Purchases increased 7.4 percent to a 6.54 million annual rate, exceeding the highest estimate of economists surveyed by Bloomberg News, figures from the National Association of Realtors showed today in Washington." The units purchased increased, but given that most real estate activity has been centered on the low-end of the market, I'd guess that the total dollar volume of real estate sales was down. This seems to be born out by this stat -- " 71 percent of the houses sold cost less than $250,000". One thing to keep in mind about jobs data coming out in 2010, we'll have to work hard to back out census workers from the data to try to get a core number. There could be 400-500,000 temporary workers added to the payroll data in coming months. These are jobs so they shouldn't be completely discounted, however, it's important to remember that these are temporary jobs that will disappear in the middle of the year. PS - As the new year creeps up on us I'm contemplating starting an online training group for the Kingston Half Marathon. I'll post a daily training schedule for everyone interested and shoot to host weekend long-runs for those interested. The Kingston Half isn't until the end of April so a 12 week training schedule doesn't really have to kick in until the middle of January. If all goes well, there is talk of pushing forward to completing the Toronto Waterfront Marathon in September. Drop me a line in comments if you're interested. From Boston.com... the entire article is worth a read. This is just one professor's opinion but I think it is a fairly honest appraisal of many American students. It's not something that we want to hear - that our kids are lazy, that they are creative with no background knowledge - but we need some tough love as a society to fix this work ethic gap. "By the time students are in college, habits can be tough to change. If you’re used to playing video games like “Modern Warfare’’ or “Halo’’ all night, how do you fit in four hours of homework? Or rest up for class? Teaching in college, especially one with a large international student population, has given me a stark - and unwelcome - illustration of how Americans’ work ethic often pales in comparison with their peers from overseas. My “C,’’ “D,’’ and “F’’ students this semester are almost exclusively American, while my students from India, China, and Latin America have - despite language barriers - generally written solid papers, excelled on exams, and become valuable class participants. Chinese undergraduates have consistently impressed me with their work ethic, though I have seen similar habits in students from India, Thailand, Brazil, and Venezuela. Often, they’ve done little English-language writing in their home countries, and they frequently struggle to understand my lectures. But their respect for professors - and for knowledge itself - is palpable. The students listen intently to everything I say, whether in class or during office hours, and try to engage in the conversation. Creativity without knowledge - a common phenomenon - is just not enough." We all expected the third quarter numbers to be revised down, but the scope of the revision was pretty dramatic. Down from 3.5% growth originally reported to 2.2% growth. The growth was principally driven by exports (the weak US dollar makes our exports cheaper to overseas buyers) and government spending. The principal areas of revision included business investment, consumer spending and inventory changes. Given that almost 1.7% of the growth in Q3 was due to "Cash For Clunkers" the balance of the growth (0.5%) was also impacted by other stimulus and the First Time Homebuyer Credit. My point is that organic growth in the US economy -- the number that one uses to measure a company's health -- is extremely low right now. There have been some positive signs (like temp hiring last month) but this revision is worth keeping in mind when the fourth quarter GDP are released in January. Keep in mind that Federal and State budgets are premised on 3% growth next year and a corresponding rebound in tax revenues. Without a big snapback we could be facing huge deficits and more spending cuts in the spring. Now Q1 2010 should show a substantial rebound in growth, but by as employment lags the recovery could stall out. Will 2010 be the year of the tech ipo? I'm not buying this logic, but there are a number of tech companies lining up for potential ipos - Facebook, Twitter, Yelp (local review site like Angie's list), Zynga (makers of all of those terrible data mining games like Farmville, Mafia Wars, etc) - and raising money like ipos are just around the corner. I don't buy it because these sites are all the pets.com of this decade. I don't see any value in any of these businesses outside of data mining for advertising. Someone does see value because they are getting huge money but I've tried all of them (except Zynga) and I think they're zeros. The concern that Europe might struggle with debt problems has led to more buying of the US dollar and that typically has led to stock declines (stronger dollar equals lower commodity prices) but not today because we're all in the holiday spirit. * Alcoa is having a great day in the market up almost 9% on the news that they'll partner with Saudi Arabia to build a giant aluminum complex in the middle east. * Microsoft's CFO makes an interesting career choice sliding over to the same role with GM. "Verizon Wireless has decided to charge a huge $350 penalty to some of its customers who walk away from their agreements." Wow, that seems a little aggressive. Watch for Congress to try to get a little goodwill out of this story by calling for an inquiry. For the first time in recorded history is actually paid to live north of Westchester as we dodged that big winter storm. Unfortunately, this is going to make analyzing retail sales for the Christmas season because every retailer with a location within 50 miles of the East Coast is going to blame this storm for any perceived weakness in their holiday sales. I find the sudden religion that so many have found with regard to our nation's debt load to be more than a little disingenuous. It's correct to be concerned about our crushing debt but this debt has been building for 30 years so to act like it has been caused by the runaway spending of a President/Congress that have been running the show for 11 months is either ignorant or deceitful (or both). "What is a "trillion?" If you laid 1 dollar bills end to end, you could make a chain that stretches from Earth to the moon and back again 200 times before you ran out of dollar bills!" Our colleague Rob Arnott, who always does terrific research, wrote in his recent report that "at all levels, federal, state, local and GSEs, the total public debt is now at 141% of GDP. That puts the United States in some elite company--only Japan, Lebanon and Zimbabwe are higher. That's only the start. Add household debt (highest in the world at 99% of GDP) and corporate debt (highest in the world at 317% of GDP, not even counting off-balance-sheet swaps and derivatives) and our total debt is 557% of GDP. Add the unfunded portion of entitlement programs and we're at 840% of GDP." This isn't entirely accurate because it includes some double counting, but they are startling numbers. However, like the person that wakes up 50 lbs overweight it didn't happen because you ate an extra bowl of ice cream last night, it took years to build up this debt situation. I've been a little obsessed with cool space videos on youtube lately. This video from the Museum of Natural History is really, really cool. It takes a little while to get going, but it's a worthwhile waste of time. What an interesting juxtaposition relative to our government's philosophy which seems to be "We must prop up home prices at ANY cost!". "The decree is expected to pour cool water on the ever-growing prices of urban houses nationwide, analysts said. Beijing will impose a sales tax on homes sold within five years of their purchase, increasing the time period from two years." China is also moving to control runaway prices by requiring a 50% down payment on any purchases of land. For all of their flaws, China has the benefit of running their government outside of the influence of lobbyists. When they see something that needs to be changed. They change it. Now, I'd probably be in jail serving 12 years of hard labor for some of the things I write on my blog, but it might be a small price to pay to rid our system of lobbyists. Oracle, Nike and Research in Motion seem to be the story of the day. Today is another option expiration so watch for crazy moves to the upside or downside. "Since November 2008, the number of nonfarm jobs (private plus public sectors) in New York State decreased by 211,600, or 2.4 percent, and the number of private sector jobs decreased by 194,800 or 2.7 percent. I'd be very interested in seeing how an area with a high concentration of government related employment (perhaps the counties surrounding Ft. Bragg, Ft. Hood, Edwards Air Force Base, etc) weathered the last major economic tsunami in 1982. I suspect that the regions would have lagged the recovery in the private sector but the mid-80s also saw a meaningful increase in defense spending that might skew the data. My point is that when the private sector ultimately rebounds in the US, the Federal and NYS government could lag by 2 to 3 budget cycles so hiring (post-stimulus 2.0, 3.0, etc) and that could impact our local unemployment picture. Given the relatively small population in NNY a change of just 500 jobs will move our unemployment rate by over 1 full percentage point (ie, lose 1,000 jobs and our unemployment rate jumps to 10.8% in Jefferson County). There should be a pretty good tug of war tomorrow in the markets. The dollar strength is whacking the market, but surprising strength from Research in Motion (maker of Blackberry) should help tech stocks. I'll be interested in hearing more about how Blackberry is seeing higher demand in the face of droid, iPhone, google phone, etc. On another market related topic, note that Citigroup accounted for almost HALF of all NYSE volume today. That's not a sign of a healthy market. It's also a sign that someone is dumping large volume of Citi and someone is defending the stock by buying every dip. It should be interesting to watch this battle unfold. It's some pretty clever marketing from the boys and girls at TimeWarner with their "Roll over or get tough" campaign. The cable company implies that some of the networks are asking for a 300% hike in their fees. However, they don't identify which networks are requesting hikes this high. The rumored networks include E!, HGTV, Fox, etc., but I haven't seen a good list of who is requesting a higher fee. The clever part is the marketing from TimeWarner. If TimeWarner keeps all of your channels as they are today, expect a meaningful hike in cable rates soon and TimeWarner will come off looking like the good guy because they've planted the phrase "300% hike" in your head. Maybe they'll increase rates 8% and while many will complain, the standard response will be "some of our costs went up 300% and we're only passing a portion of that cost on to you!". Again, it's probably some no name network that charged $1 last year asking for $4 this year, but the 300% figure will prove to be a marketing win for TimeWarner. I readily admit that I don't get the Zhu Zhu pet phenomena. Actually, I'm pretty sure that no kid is clamoring for these things, but someone got a press release into the right hands and then overnight it became a hot toy. Consider the Amazon reviews here which are not very flattering. However, if you are tempted to wast..., I mean spend your money on these things the best bet in town will be Walmart next week. "From December 21 to December 23, starting at 7 am local time each day, Walmart stores will have stock of the hard-to-find Zhu Zhu Pets Hamsters for $8 each. That's the lowest price we've seen for these in-demand toys. (We've only seen them for as low as $18 shipped.) Sales tax is added where applicable. Please note that approximately 20 to 60 Zhu Zhu Pets will be available per store per day. Customers will receive tickets on a first-come, first-serve basis prior to store opening. Limit one Zhu Zhu Pet per customer per day." $8 seems reasonable for these things. They'll be flooding the dollar store by March. Wow, I can't believe I'm just getting around to addressing the "Bernanke as Person of the Year" story. There are many people that will cite the magazine cover indicator which says that when something hits the cover of the mainstream mags, it/he/she has peaked. It' s too early to say, what Bernanke's ultimate legacy will be, but he's been the focus of the financial world for much of the past 12 months so it's a worthy selection as someone who is newsworthy. TIME: Do you have a mortgage? Bernanke: Oh, yes, we refinanced. Bernanke: About 5%. A couple of months ago. Bernanke: Yes. We had to do it because we had an adjustable rate mortgage and it exploded, so we had to. Bernanke: Thirty years fixed rate at a little over 5%. I think I threw up a little in my mouth when I heard that The FEDERAL RESERVE Chairman had an Adjustable Rate Mtg that EXPLODED. This is like the Surgeon General smoking 3 packs a day. I think it's safe to ignore any prediction from someone that felt it was a wise choice to hold an ARM through the financial crisis (on a separate note: How does the Fed Chairman even get a mortgage without it being some sort of conflict of interest? My wife works for an accounting firm that may have done some audit work for Exxon once so I can't buy gas from Mobil, but the Fed Chair can get a mortgage from the very banks he's saving?). "The Empire State Manufacturing Survey indicates that conditions for New York manufacturers leveled off in December, following four months of improvement. The general business conditions index fell 21 points, to 2.6. The indexes for new orders and shipments posted somewhat more moderate declines but also moved close to zero." The American Institute of Architects’ Architecture Billings Index declined to 42.8 in November from 46.1 in October. Any reading below 50 indicates contraction. "There continues to be a lot of uncertainty in the construction industry that likely will delay new projects in the near future," said Kermit Baker, chief economist at the American Institute of Architects. The people at Human Capital Score strive to assign a "score" to each prospective college student that will rate their prospects for future earnings. The score was designed to allow their lenders to sift out risky credits and lend to the better students with better prospects at achieving higher earnings in the future. However, many have taken the process to a new level by using it as a decision tool in the "should we even bother paying for college?" question. The data is pretty solidly behind the fact college graduates "generally show higher rates of civic participation, engaging in volunteer work and donating blood at more than twice the rate of high-school graduates, says the College Board study. They are less likely to smoke and more likely to exercise daily. College grads also have a much higher likelihood of being happy." "However, a long-term study of 6,335 college grads published in 1999 by the National Bureau of Economic Research found graduating from a college where entering students have higher SAT scores—a sign of exclusivity—didn't pay off in higher post-graduation income. What matters more, it seems, is graduates' personal drive. In a surprising twist, a stronger predictor of income is the caliber of the schools that reject you. Researchers found students who applied to several elite schools but didn't attend them—presumably because many were rejected—are more likely to earn high incomes later than students who actually attended elite schools. In a summary of the findings, the Bureau says that "evidently, students' motivation, ambition and desire to learn have a much stronger effect on their subsequent success than average academic ability of their classmates." I couldn't agree more. The most successful people I've ever met were the most driven, not necessarily those from the best schools. It appears that Citibank's TARP repayment is more of a tax evais... oops, there I go again --- I mean, a tax planning strategy. "The Internal Revenue Service on Friday issued an exception to long-standing tax rules for the benefit of Citigroup and a few other companies partially owned by the government. As a result, Citigroup will be allowed to retain billions of dollars worth of tax breaks that otherwise would decline in value when the government sells its stake to private investors. "At the end of the third quarter, Citigroup said that the value of its past losses was about $38 billion, allowing it to avoid taxes on its next $38 billion in profits. Under normal IRS rules, a change in control would sharply reduce the amount of profits that Citigroup could shelter from taxes in any given year, making it much more difficult for Citigroup to realize the entire benefit before the tax breaks expired. The precise value of the IRS ruling depends on Citigroup's future profitability and other factors, but two accounting experts said it was fair to estimate that Citigroup would save at least several billion dollars as a result." I was extremely disappointed with the Bush Administration's handling of the crisis and I was hopeful that the Obama Administration would stand up for the taxpayer. However, given Geithner's ties to Wall St. I guess it's not that surprising. The arrogance of this action is beyond comprehension. Speaking of the power of the Internet, it seems the people of the UK have finally had enough of Simon Cowell. They've launched a campaign on the web to try to make Rage Against the Machine's "Killing in the Name of..." from 1992 (a song that still resides on my workout playlist) beat out Cowell's latest X Factor winner in Christmas record sales. The key chorus of the Rage Against the Machine song "**** ***, I won't do what you tell me" is seen as a small act of defiance to the pop star machine that is Simon Cowell. "Rock band Rage Against The Machine is ahead of X Factor winner Joe McElderry in the race for the Christmas number one, early sales figures suggest. A Facebook group aiming to get the band's 1992 hit Killing In The Name to the top of the festive chart has attracted more than 750,000 members. But McElderry's debut The Climb, out on CD on Wednesday, is expected to catch up by the weekend. McElderry's song was only released digitally after his victory in the X Factor final at midnight on Sunday, giving it less time to rack up sales for this week's chart than Rage Against The Machine. X Factor judge Simon Cowell has criticised the internet campaign, calling it "stupid". The question that I get asked repeatedly is: "If the banks are paying back the TARP money they must be doing great, right?" Well, not entirely. The banks are repaying the TARP money through the issuance of new stock. They can issue this new stock because their stock prices have doubled or tripled since March. Why have their stock prices rebounded so sharply? In large part due to the Fed's purchase of mortgage backed securities, the loose lending by the FHA, the first time home buyer tax credit, mortgage modifications, accounting changes that allowed the banks to mask losses and trading gains realized by using capital from the Fed to fund trading operations. Many of these programs may end next year and many mortgages appear to be teetering on the edge. I think the banks realize that next year could be another difficult year and if their stock prices get whacked they won't be able to raise the funds to repay TARP next year so they are rushing to get out now. For example, Citigroup has to issue 5 billion shares to raise $20 billion at it's current prices that represents about 20% of it's outstanding shares. If the stock falls back to $2, they have to issue 10 billion shares or suffer 40% dilution to repay TARP. Can you imagine the controversy in Washington next year if the banks spiral out of control again are "Even BIGGER than too big to fail" as the NY Times put it today and come back to the taxpayer with their hat in hand in an election year? A couple of news outlets keep running this story that sales of fresh Christmas seem to be ticking up this year. Perhaps there is a small uptick in the early portion of the season, but small samples sizes make this data hard to believe. Also, all of the data keep citing the units of trees sold, but given the increased market share of Walmart, Home Depot, and Lowes selling $19.99 6' trees, I'd guess that the total value of trees sold will likely be flat to down this year. The market held up throughout the day as a result of the Dubai bailout -- again note the irony that the bailout of a pending disaster has pushed the markets to new highs while the initial crisis barely dented the market. These are again important technical levels and if the market can break higher by 1% or so there are many reasons to believe it could power higher another 4 or 5% in a week (option expiration and short covering). The market remains wildly detached from reality so you have to analyze the market like a weatherman predicting the humidity inside the New Orleans Superdome --- look at factors beyond fundamentals (electricity rates, a/c failure rates, etc) rather than simply measuring the humidity outside of the building. The stock market has been a game of green and red letters flashing across a screen for the past decade, but this latest move really defies logic. "School districts and the state will pay 70% more next year for teachers' retirement. And the increases are expected to worsen." The Public School Employees' Retirement System trustees on Friday approved an employer contribution rate of 8.22 percent for the 2010-11 budget year, a 12-year high for the system and a 72 percent jump from the 4.78 percent contribution rate in place now. That means taxpayers will have to spend $1.1 billion next school year for teachers' pensions, or almost $500 million more than this year." NYS is looking at a similar situation and although their investment performance has improved in 2009 as the spokesperson for the pension fund said " At this point, the fund cannot realistically earn its way out of the projected rate spike." These are the sort of grim statistics that Gov. Paterson is dealing with every day and I applaud his honesty. Unfortunately, no one wants to hear the truth they'd rather hear that it's all cotton candy and candy apples for breakfast, lunch and dinner. There is an indication that pension costs and property tax hikes needed to cover those costs are exempt in PA from needing voter approval. Does anyone know if this is the case in NYS? I think it would be pretty hard for everyone to swallow another 5% tax hike in NNY, but it may be coming. This was filed under "examples of extreme laziness".... Only Nike would have the b@! !$ to pull this one off..... 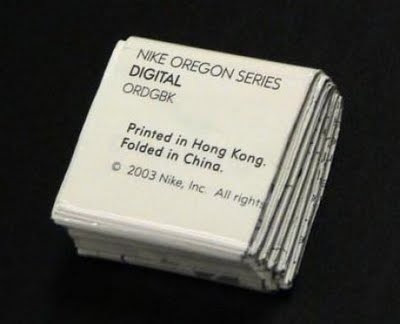 Printed in Hong Kong, but FOLDED in CHINA. No wonder they are becoming the dominant economic power in the world. They've got mad origami skills. As you are helping Santa wrap presents for the little ones this year do a little private survey - percentage of gifts mfg'd in China. We're running north of 80% right now and that's just because we have a bunch of books that were printed in the US. One of my big complaints with the current administration is that they seemed determined to repeat the mistakes of the Bush Administration (please spare me your 8,000 word manifestos on why one political party is better than the other -- I'm just looking at the financial part of the equation and frankly both parties seem to be in Wall Street's back pocket). The great takeaway from 2007-2008 is that too much risk was concentrated in too few institutions. Clearly, we've learned from that mistake and decided to prevent another global calamity by spreading risk, right?? And you get a bailout and you get a bailout..... Abu Dhabi agreed to bailout Dubai through April with a $10 billion loan overnight. This caused massive swings in Asian markets overnight (The Hang Seng went from down 300 to up 300 in about 60 minutes) but by the time US markets opened we'd given up most of the gains. There is tremendous irony in the fact that after crashing world markets for a couple of days, a bailout for Dubai could somehow push the global markets to new heights. This quote sums up my feelings as well "This is one of the most ridiculously irrational markets I’ve ever seen. The other "good" news this morning is also the same old songs: Citigroup will repay their $20Bn TARP loan by diluting their stock by about 20%." Insiders don't believe the hype... Insider moves are never a perfect predictor of future stock price action, but the lack of conviction shown by insiders (defined as C-level executives and directors) during the latest rally is surprising. Insiders continue to dump stock of their own companies as the market has risen 60%+ despite signs of a "recovery", what would be their rational? Insiders have many reasons for selling stock --- estate planning, tax evasi... I mean tax "planning", private school bills, property tax bills , etc... but the disparity between buying and selling has rarely been so wide. The retail sales data for November was slightly better than expected - up 1.3% in November but remember the data is not adjusted for inflation so higher gas prices (up 3.5% for the month) had a meaningful impact on the data. Excluding gas and autos, retail sales were up a more modest 0.6% in November. "The first week of December, typically a lackluster time in the wake of Black Friday, was particularly slow. Sales for the week ended Dec. 5 fell 18% from the prior-week period, which included Black Friday, according to market researcher ShopperTrak RCT Corp. Last year, when the recession was in full force, sales fell a lesser 14%, according to the firm, which compiles shopping traffic at malls and uses sales statistics, as well as Commerce Department figures, for its estimate. So, in the midst of the great recession last year sales dipped 14% from Thanksgiving week until the first week of December. This year as things are improving sales fell 18%!! Consumers are holding out for big, deep discounts and they may get them sooner rather than later (locally, many retailers have cut prices 25% on seasonal gifts already. That could jump to 50% by next week). One of the problems with saying things are getting better when they may really be just getting "worse more slowly" is that since the trajectory is still downward you can reaccelerate at any point. The Bank of Japan’s Tankan business confidence index may rise the least since the economy emerged from its worst postwar recession as companies become more concerned the yen’s gains will erode profits. The Tankan index of sentiment among large manufacturers will climb 6 points to minus 27 in December, according to the median forecast of 16 economists surveyed by Bloomberg News. It would be the smallest improvement since the first quarter. A negative number means pessimists outnumber optimists. Railcar traffic is a pretty good indicator of future economic activity. After a period of inventory restocking in the summer, rail traffic has dipped again and is trending below last year -- although much of the dip is due lower coal shipments. accounting for most of the 96,900 total carload decline for the month. • U.S. intermodal traffic (which isn’t included in carload figures) totaled 794,184 trailers and containers in November 2009 down 6.7% from November 2008 and down 14.1% from November 2007. The trendline is still upward sloping despite the dip in November. I think it will be interesting to see what level of inventory restocking occurs after the holiday season. I've spent a fair number of pixels detailing the rush of the FHA into the housing market in 2009 and highlighting the fact that many of these loans are being made to riskier borrowers with little money down and FHA guarantees. Now enter another layer of intrigue... GNMA or Ginnie Mae. "Ginnie Mae's ongoing relationship with these firms allows them to swap the home loans they've made for new cash so they can make more loans, which can then be traded for even more cash to make even more loans. Housing experts say this dynamic turbocharges the type of bad mortgage lending that first helped trigger the financial crisis that battered global markets over the past two years. And ultimately, taxpayers are on the hook for the troubled mortgages. "Ginnie is like an accelerant to a fire," said Anthony Sanders, professor of real estate finance at George Mason University. More than a dozen lenders with Ginnie's endorsement have made loans that are now delinquent at rates far in excess of what regulators consider acceptable. And some of these lenders have been accused of misleading both borrowers and the government about these loans." I've been looking for an excuse to use this picture for the past month --- this pair of swans took up residence in Carrier Bay just outside of Clayton in early October before moving on to warmer water. A Black Swan event is something unforeseen that shocks the financial or political system (the name originates from the discovery of black swans in Australia which were assumed to be impossible but later found to be quite real). Think about the Bear Stearns/Lehman collapses. Well, as we are coasting into the end of the remarkable year that has been 2009 we're getting some weird market action around the world in many small markets. Dubai is down about 43% in the past 2 weeks as their credit crisis has intensified. Greece, the Baltics, Spain and Ireland are all in deep trouble. I think there is a possibility that 2010 could be the year of "sovereign defaults". This is on everyone's radar because of the problems in Dubai, but I don't think people have placed very large odds a major nation defaulting. If a G-20 nation defaulted it would be akin to Lehman or Bear Stearns going under. I'd say it's under a 10% chance right now but it's something to watch. "I wish someone would give me one shred of neutral evidence that financial innovation has led to economic growth — one shred of evidence,” said Mr Volcker, who ran the Fed from 1979 to 1987." As bankers demanded that new regulation should not stifle innovation, a clearly irritated Mr Volcker said that the biggest innovation in the industry over the past 20 years had been the cash machine. Citibank is moving toward repaying it's TARP borrowings, not with earnings or recovered assets, no that would be hard, they're doing it the old fashioned 2006 way -- by issuing STOCK!! Weird fact of the day: Amazon is worth more than Target and Costco combined. Japan announced their final GDP numbers for the third quarter - growth of 1.3% for the quarter vs. an initial estimate of 4.8%!!! That's a bit of a miss even for a government agency. This was somewhat telegraphed earlier this week when the Japanese started another $81 billion stimulus program. The initial reaction to this news was "Huh, they might know something that we don't know" and sure enough, it turns out they knew that their economy was growing at 1/3rd of the rate that they had initially reported. Mortgage Modifications just aren't working. One of the biggest pushes this year to improve home affordability has been to modify mortgages through a government program called HAMP. However, for some reason many borrowers that have had temporary modifications have been unable or unwilling to complete the process to make their modification permanent. "Currently servicers report that about 375,000 trial modifications will have finished a three month trial period with timely payments before 12/31/2009. Informal survey data from servicers indicate receipt of complete documents in about 30% of active trial modifications – these modifications where borrowers have returned all required documents need to be decisioned by servicers as quickly as possible. Thousands of borrowers have successfully converted trial modifications to permanent modifications – but this is a low number compared to the total number of trial modifications." It sounds like the number of permanent modifications is running in the low single digits. Many people think that a major factor preventing more documents from being submitted is that borrowers are unable to document the salary data that they used to get their original mortgage. "I have 100 percent conviction that the consumer is not getting any better and there's not more liquidity," Whitney said. ... "For a 2010 prediction, which is so disturbing on so many levels to have so many Americans be kicked out of the financial system and the consequences both political and economic of that, it's a real issue. You can't get around it. This has never happened before in this country." Spending is hard to gauge right now because the holiday's tend to drive additional spending that might otherwise not exist. We'll get a better feel for how the consumer is struggling or thriving in the first quarter of 2010. Finally, just a heads up to any customers of a certain large propane supplier that "resides outside of the city." If I hadn't been following propane prices closely I might not have noticed that they billed me at 2008 prices which are about 20% higher than current prices. They claimed that it was an honest mistake, but I'd make sure to check your bill closely if you're a propane user. I always try to give Google the benefit of the doubt but this is app seems a little ridiculous. So did anything happen while I was away? The market keeps rallying on hopes and dreams, the jobless rate FALLS, Dubai implodes......nope nothing to see here. The market rally continues to stun everyone in the field. Now, even when the dollar rallies, stocks seem to move up. Again, if business prospects were improving, I'd say that this is a healthy indicator, but business prospects for everyone outside of those directly benefiting from stimulus efforts seem to be worsening. Hat tip to Eric for pointing out that enterprise software sales are closing at just 13% while budgets are getting crushed for 2010. Unless you are a supplier of paint, paving equipment or orange vests for highway crews, I think 2010 might be another tough year. Side note, I spent a fair amount of time driving over the past 2 weeks and the amount of "infrastructure" spending is startling. However, it's almost all superficial infrastructure work. Literally, repainting lines on the roads or repaving roads. Very little work that will improve efficiencies for anyone, IMO. I'm a supporter of targeted stimulus, but this spending seems to be about as targeted as google ads. Oh boy, the jobs report. How many times did I scream at the TV on Friday? Yes, the percentage of unemployed persons fell, BUT (there's always a but) it's just math games. Here's what happened: Let's say in October 102 people out of 1,000 people in the labor force were unemployed. 102 divided by 1,000 produces an unemployment rate of 10.2%. Now, let's say 2 of the unemployed get tired of looking so they drop out of the labor force, the numbers for November now become 100 unemployed persons out of 998 people in the labor force. 100 divided by 998 = an unemployment rate of 10.0%. Hey, HAPPY DAYS ARE HERE AGAIN, because the unemployment rate fell!!! Now, the numbers were larger, but this is exactly how the unemployment rate fell in November. More people stopped looking for work. Most of these unemployed persons that fell out of the labor market might be encouraged by the jobs report last week and might start looking again and that could cause a big swing upward in the unemployment at the beginning of 2010 -- in my example if 10 people decide to start looking again the rate would climb to 10.9% because now 110 people out of a labor force of 1,008 would be looking for work. With regards to the jobs lost of just 11,000 this was surprisingly good, but again it comes with a caveat. Much of the out performance was due to temporary help hires. As I've said before this can be a good sign that companies are seeing an uptick in business so they hire temp workers before making them permanent. However, I suspect that this time around the increase in temp hiring is due to employers replacing permanent workers with permanent temporary workers. There is also some talk of a tax credit for hiring next year so it makes sense to avoid permanent hires right now. The balance of the hiring came in 5 areas: Federal Gov't, State Gov't education, Local Gov't education, healthcare (ambulatory, home health and hospitals), and the mythical BIRTH/DEATH ADJUSTMENT. This "hiring" offset meaningful losses in goods producing jobs which tend to be higher wage jobs. Again, it's better to lose just 11,000 jobs than to lose 700,000 jobs like we were a few months ago, but remember not all jobs are created equal and it is a myth that corporations are actively hiring again. Don't lose sight of the fact that the bulk of the hiring was government and temp workers. Finally, with regards to the stock market the ratio of bulls to bears is back at levels not seen since the dotcom era. This type of complacency tends to end poorly.